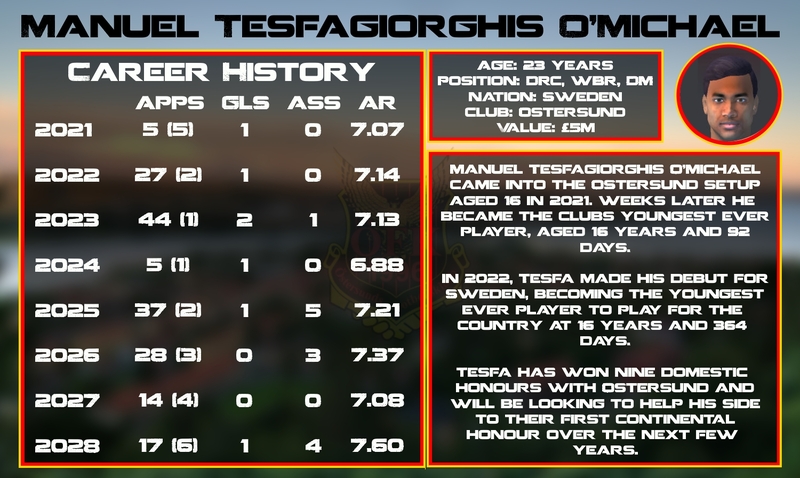 Back in 2021, so 7 years ago now as we end season 12 with Ostersund, we checked our youth intake to find Manuel Tesfagiorghis O’Michael (or Tesfa for short). The 16-year-old Swede was rated as a 3-star current ability player with 5-star potential. The following post will review how he has developed with Ostersund now that he is 23 years of age. Tesfa came into our club in the 2021 youth intake. As a 16-year-old he was clearly good enough for the first team and was put straight into the senior squad. On initial viewing of the youngster, I wasn’t really too sure of his best position. He could play as either a centre-back, right-back or DM, but with low attributes in heading and jumping reach I would hesitate to use him as a CB. He also had a poor personality of ‘low determination’ which I would have to tutor out of him! You can see that Tesfa has several attributes that are of a decent standard for the HB role – he has a good technique for a defensive player, excellent decisions for someone so young and good positioning and teamwork. The plan from the very beginning was to train Tesfa in the half-back role but to give him playing experience in any position possible. I thought that he would develop into our first-choice DM in the future, but in order to progress he should be given as much first-team experience as possible. In actual fact, I find out recently that first-team football has no effect on a players development before they turn 18. Players under the age of 18 will only develop through training and not match experience. Therefore playing Tesfa in our first-team right from the beginning didn’t have any effect on his development. For more juicy nuggets of FM info like that one, I’d recommend you join FM Slack. You can contact me on Twitter where I can manually send you an invite. What stands out here is how well Tesfa played in his first season of professional football. He won all 12 of the matches he featured in and also accrued an average rating of 7.32 – very impressive. Tesfa also made his international debut for Sweden, though this has a lot to do with the fact that I was the Swedish manager! A year has passed and Tesfa has earned another two caps for Sweden. Oscar Friberg resigned from Sweden duty at the end of the 2022 World Cup, so it will be interesting to see when Tesfa next makes an appearance for Sweden. Over the course of the last fourteen or so months, we have used the tutoring system in order to improve Tesfa’s personality and determination. This has been successful so far but the process hasn’t ended, I’d still like to see Tesfa develop a professional personality in order to really help his development. Consistent is the word I would use to describe Tesfa’ second season in professional football. The highest rating in his 22 matches was a 7.14 and his lowest was 7.08. That’s quite incredible really! Tesfa turned 18 on the 1st June 2023, meaning that from this point onwards he would be able to improve through match experience, rather than just from training. So have we seen any further development as a result of this? Over the 2023 season, we transitioned Tesfa from a CB to our right-sided wing-back. Previously we were training Tesfa as a half-back but for this season we trained him as a WB. You can see from the screenshot below that Tesfa ended the season as our right-back. Here are the attributes required to be an effective wing-back. You can see that Tesfa has decent attributes for this position, especially in tackling, positioning, decisions and stamina. The plan is to now play Tesfa as our first-choice right-back for the foreseeable future. Disaster struck in Tesfa’s fourth year. Early in 2024 Tesfa damaged his cruciate ligaments and was ruled out for 6-9 months. A crushing blow – a lot of time out for a player this young could really hamper his development. In total, Tesfa was out for seven months. He returned to play a couple of matches in the first team at the end of the season but I was, understandably, reluctant to use him in case of further injuries occurring. Tesfa’s attributes declined in all areas, but he was most affected physically. Here you can see the fast decline of his physical attributes in the period he was out injured. Tesfagiorghis remained fit for the majority of this three year period, making 39 appearances in 2025, 31 in 2026 and 18 in 2027. 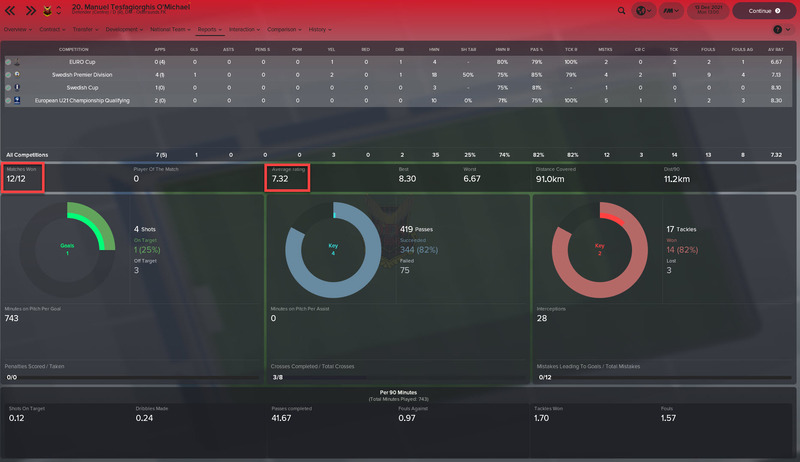 He was second-choice in 2027 as we brought in a much better right back. He will still be playing as a rotational option but as he is in his early twenties we really need to focus on quality rather than potential. He just isn’t as good as my other option. I have now decided that Tesfa will train purely as a wing-back and this will be his position moving forward. We did spend some time training Tesfa as a CM, DM and CB during his time with us but playing him as a right-back is the best option moving forward. Here is a GIF of how Tesfa has developed in his time with Ostersund. You can see clearly from the attribute graph on the right-hand side how little Tesfa has developed with us. His speed has fallen sharply, largely down to the injury he suffered in 2024. Mentally he has improved and you’d expect him to continue to do so, but this is partly down to our tutoring we gave him that boosted his determination. What went wrong? How could I have helped Tesfa reach his potential? In this section we are going to review some of the factors that could be behind Tesfa’s poor development at Ostersund. Later on we will simulate Tesfa’s career three times to see if he could develop better under a different manager. It will be interesting to see the results! So, what could have gone wrong in Tesfa’s development? As soon as I see the message in my inbox headed ‘Ostersunds FK announce new intake of youth players’ I immediately go to the youth candidates team to see what we have. Then my eyes dart towards the stars. Any player with at least three and a half star potential attracts my attention. But stars don’t always tell the full story. 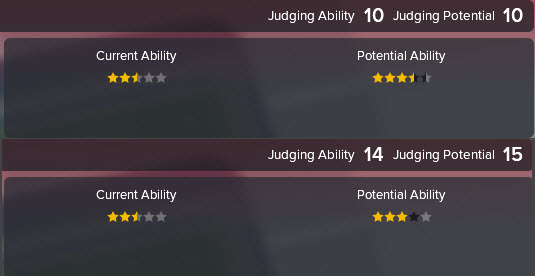 The top part of the screenshot shows the rating given by my assistant manager and the bottom screenshot shows how my best coach, in terms of judging potential, rates Tesfa. There is a half a star difference in how they rate our player. Manuel Tesfagiorghis O’Michael came into the Ostersund first-team immediately. He is, in fact, Ostersund’s youngest ever player. Could this have had an effect on his development? Here are two short articles that discuss the problem that Tesfa could have faced. Two other names that spring to mind are Jack Wilshere and Luke Shaw, both came into the Premier League as highly-rated youngsters and arguably neither has reached their potential. Tesfagiorghis had already played 61 first-team matches before turning 18. Now aged 23, he has made 201 appearances for the Ostersund first-team and has 5 caps for Sweden. Let’s also remember that he was out of action for most of the 2024 season! In 2024, Tesfa suffered a 7-month injury that meant that he lost out on a lot of time where he could have developed quicker. We mentioned earlier that players do not improve through match experience until they turn 18. Tesfa turned 18 in June 2023 and injured his leg in early-2024, therefore he missed a lot of time where he could have earned a lot of match experience. This, I have no doubt, had a large impact on his development. I’ve mentioned throughout that I have trained Tesfa in multiple positions. At the beginning, I trained him to play as a half-back. Later on, he was trained as a wing-back, then a central midfielder, then a centre-back before going back to being trained as a wing-back. Not having a set position could have affected the development of Tesfa as he will have been training a variety of attributes instead of a specific set, reducing the effect of training for our youngster. At the time of Tesfa’s appearance in our youth team, our training facilities were at an average (2 and a half star) standard. Over the eight seasons since, we have improved our facilities to become state of the art, or 5-star. This would impact how Tesfa develops through training, though as we have improved our facilities I can’t see how much of a negative impact our facilities would have had. 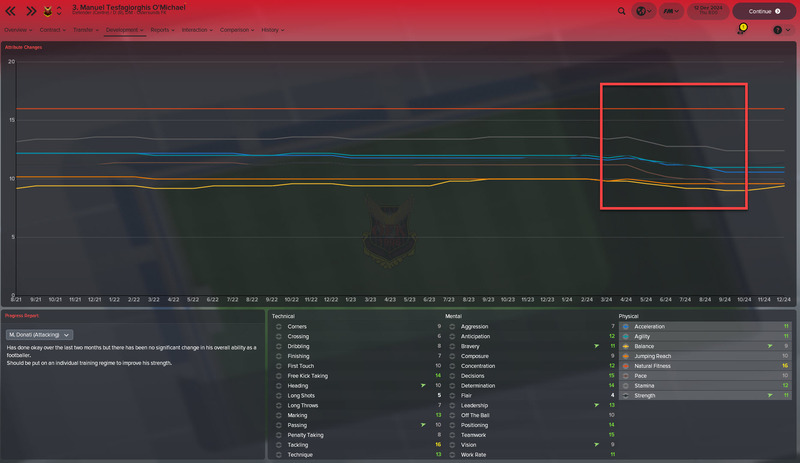 One factor I had overlooked for the majority of my Ostersund save so far is youth coaches. 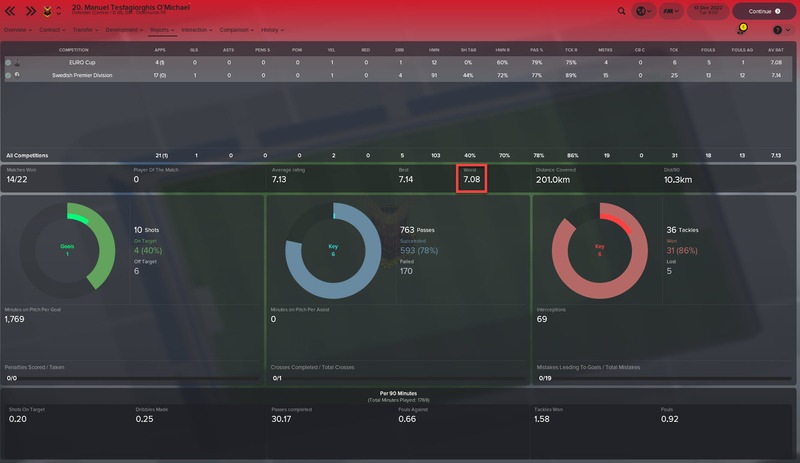 I have great coaches for my first-team and I have had so for most of my time at the club, but only recently, as of 2025/26, have I invested time in bringing up the standard of my staff for the youth teams. A parallel Universe – would Tesfa have developed better under a different manager? What would have happened to Tesfa if Oscar Friberg was not in charge of Ostersund and Sweden? Would he grow towards his 5-star potential? Would he have left Ostersund for a major European club? Thanks to having yearly end of season saves, we are able to find out. 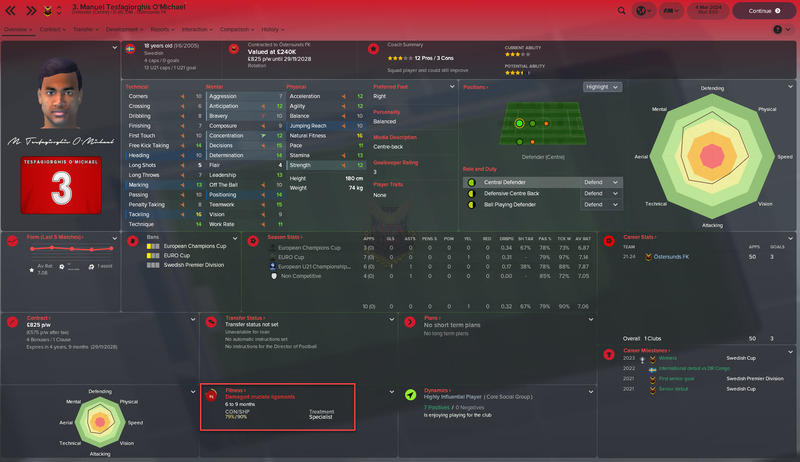 I have loaded up a save from the end of the 2021 season where Tesfagiorghis first came into the Ostersund setup. I then proceeded to have Friberg resign from both of his roles with Ostersund and Sweden before holidaying up until the end of 2028 where we currently are in our original save. But doing this once wouldn’t really show us anything, would it? So I have repeated this process three times. Let’s have a look to see how Tesfa has developed in these three parallel Universes. Tesfa transferred to Dortmund in 2023, aged 18, but never made a first-team appearance for the German club. He spent time on loan at Malmo before moving permanently to Mainz in 2027. He has been a first-team regular so far for Mainz in the Bundesliga. In our second simulation, Tesfa remained with home club Ostersund for the entirety, making nearly 50 more appearances than in our original save. Tesfa left Ostersund for AC Milan in 2024 and spent the majority of his time at the club back in Sweden! First came a disappointing loan spell with Ostersund rivals Norrkoping before two years with Hammarby. He made just one appearance for AC Milan before leaving for Danish side Kobenhaven in 2028. So, what have we learnt from our three simulations? In all honesty, I had expected far different results from the ones I’ve found. I thought that Tesfa would develop a lot more, especially after earning moves to top European sides in Dortmund and AC Milan. In fact, the only noticeable changes are his speed and mental attributes. In the original save, Tesfa regressed in his physical attributes after the long-term injury he sustained in 2024. However he progressed more mentally due to our usage of tutoring. In each simulation the results are the same, Tesfa is stronger in terms of his speed but weaker mentally. One other clear difference, although this could be to do with FM18’s poor quality of regen faces, is his change from black to white. Probably not a lot we could do to affect this change! You’d have to agree that in all three simulations, Tesfa remains largely the same player. I’d say that he is probably the better player in simulation #3, he looks far more well-rounded, but there isn’t a lot in it. I am aiming to keep Tesfa at Ostersund for the foreseeable future. He will remain our backup wing-back behind, hopefully, a top class option. I will be training him purely in the wing-back role to see if he can strive someway towards that potential that he clearly has yet to reach. Regardless of his ‘lost’ potential, Tesfa remains a good backup option and the fact he is homegrown makes him an essential part of our squad moving forward. His versatility adds to this as he can always fill in as a centre-back or DM should we find ourselves short in those areas. Hopefully you have enjoyed this in-depth look at our regen Tesfa. I have certainly refocused my attention to our youth players as I fear I have neglected them these past few seasons. The next Ostersund update will look at our new tactic – I’m really looking forward to sharing it with you! Thanks for reading. This was a fun little post to write, it’s always good to take one small part of Football Manager and analyse what has happened and what you could improve upon. I hope you took something from this post! This entry was posted in FM18 Stories, Football Manager 2018, Oscar Friberg, Ostersunds FK | @VivaLaVidaFM and tagged fm stories, fm18, football manager, manuel tesfagiorghis o'michael, Oscar Friberg, sweden, swedish allsvenskan. Bookmark the permalink.